If you are a cappuccino lover, you probably bought some coffee machine that makes fantastic cappuccino, but you didn’t get those beautiful cups that are on package picture. 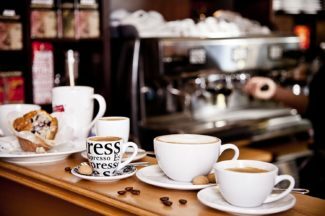 In almost every situation, you have to buy cups separately, and that is why we are writing about cappuccino cups, about their characteristics and how to get them. 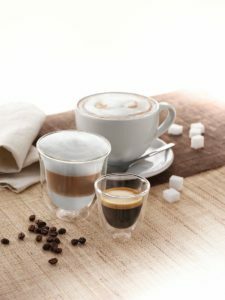 12 Ecooe 11.9oz Glass Cups for Latte, Cappuccino, Milk.. These cups have a classic appearance and they will be perfect for every occasion. In the package, you get four 6 oz capacity cups, made of double wall borosilicate thermal glass. They are light compared to ceramic cappuccino cups, and they are very durable. Since they are made of scratch resistant borosilicate glass you can wash them in a dishwasher without any concern. 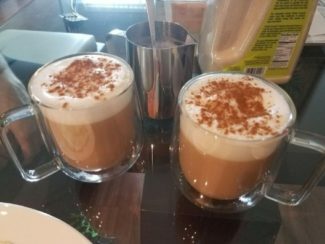 Thanks to the thermal insulated glass, they keep your cappuccino hot longer than any other cup, and you won’t burn your fingers while holding it. The best proof of these cups quality is the fact that the manufacturer gives a lifetime guarantee on them. Bormioli Rocco company has a long experience in the production of glass items. These cappuccino cups are just one of their praised products. This is a set of 4 cups, and the production style is called Oslo. Their capacity is 7.5 oz, and they are perfect not just for cappuccino, but for every drink that has milk in it. They are made of tempered glass and they keep your drink warm for a long time. All cups have a stainless steel handle to prevent any burnings on your fingers while enjoying in hot cappuccino. 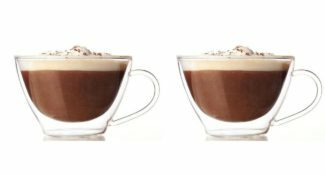 This Italian company paid attention to the appearance and made this cappuccino cups perfect for everyday and special occasions. DeLonghi is known for the production of the coffee makers, but they also produce cups for every type of coffee-based beverage. 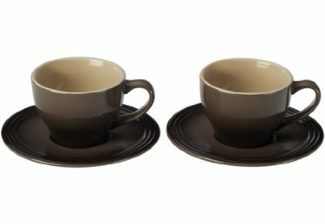 This is a set of two 6 oz cappuccino cups. Their appearance is simple and modern at the same time. 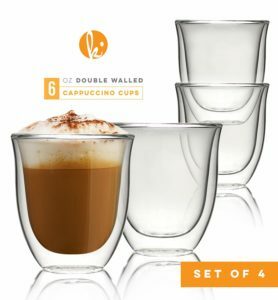 Made of double-walled thermal glass, they guarantee that your coffee will stay warm until you see the bottom of the cup. 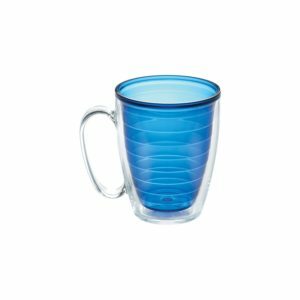 These cups are durable and their cleaning is easy, you can wash them manually or in a dishwasher. Thermal glass assures you that your drink will stay hot or cold, and there won’t be any condensation on the outer cups’ walls. 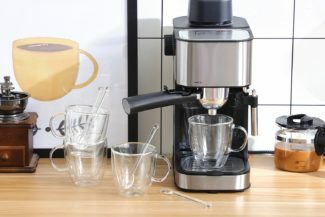 Since this is a 2-cup set, it is a perfect gift for a couple who enjoys coffee on daily bases. This is a set of four 8 ounce cappuccino cups made of high-quality porcelain. They are not transparent like the previous ones. This durable white colored porcelain gives them a classic and old-fashioned appearance. This durable porcelain makes their cleaning an easy work, you can clean them manually or in a dishwasher. Konitz company manufacture all types of kitchenware, and you can mix them with other Konitz porcelain product styles. 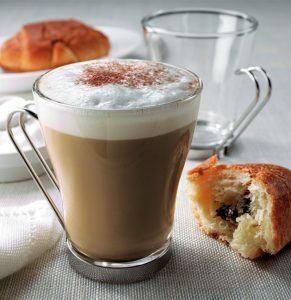 We are sure you will enjoy drinking your cappuccino from these beauties. We have to say that these ones are our favorite. Transparent as they are and with the shape of a ball, they look like a bubble. In this set, you will get two 7 ounce cappuccino cups, but you can use them for other hot or cold beverages as well. They are made of double-walled high-quality borosilicate glass, and you can clean them in a dishwasher or worm up in your microwave without any concern. They are durable and they will be a part of your kitchenware for a long time. Its double-walled glass guarantees that your drink will stay warm or cold and that your fingers will stay safe from any burnings due to hot beverages. You and your friends will enjoy your coffee from these cups. Lily’s Home Cappuccino Mugs are so far the biggest on this list. This is a set of two 13 ounce cappuccino mugs. They are made of double wall insulated borosilicate glass and they will keep your beverage hot or cold and there won’t be any condensation on your mug walls. This insulated glass mug will stay cold and you won’t burn your fingers. 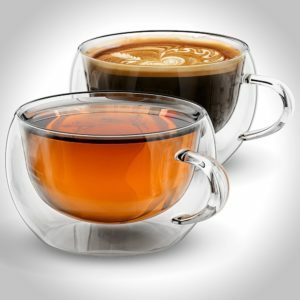 The mugs are transparent and simple what makes them perfect for everyday use or fancy dinners. These cups are durable and you can microwave them or clean in a dishwasher. We are sure that you will use them in your home for a long time. If you like to support small USA manufacturers this product will win your heart. 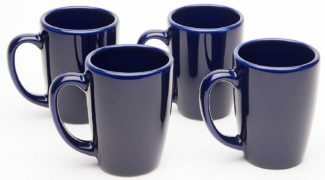 Made of cobalt blue ceramic, this set of four 14 ounce mugs are perfect for cold winter mornings or afternoon rest by the fireplace. American Mug Pottery manufacturer is well known for high-quality of their products. All of their ceramic products are lead and cadmium free. These mugs are not thermal but you can microwave them and clean in a dishwasher. Every mug made by American Mug Pottery is handcrafted what gives them a special value. They will be a favorite piece of your kitchenware. This is not a set of mugs, but having such a unique appearance, we decided to put in the list this one mug as well. You can buy them as a single item, and you can find them in different colors and designs. This is a 16-ounce cappuccino mug in a beautiful sapphire-blue color. It is made of copolyester BPA and melamine free materials. It is very durable and you can microwave it or clean in a dishwasher. This mug is a perfect gift for every coffee lover. Tervis is another USA mugs manufacturer with quality products that guarantee a lifetime usage. 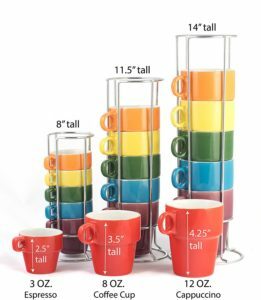 This set of six colorful 12 oz cappuccino mugs is something that we like to call a good deal. With an affordable price, this ceramic set is FDA certified and lead-free product. If you by it as a gift for someone else, we are sure that you will change your mind once you see them and keep them for yourself. These mugs are not thermal but you can microwave them and the surface of the mugs won’t be hot, you will be able to hold them without burning your fingers. They come with a chrome stand so they won’t take too much space on your kitchen counter or in cabinet. Let your day start with cappuccino drank from these colorful cups. We have been using these mugs for a long time in our office. From experience, we can guarantee that they are durable because these ones from our office literary survived everything. In this set of two, you will get 10 oz double wall insulated borosilicate glass mugs. The appearance is clean and modern. The space between cup and handle is wide and everyone with large hands will be able to hold a cup without problems. On busy days these cups will keep your coffee hot until you find some free time to drink it. They are light and clumsy people safe. You will enjoy these mugs for a long time. Le Creuset Stoneware manufacturer can be prised for high-quality and collectible pieces. My husband and I got this set as an anniversary gift and these mugs are perfect. Their capacity is 7 oz and we use them not just for cappuccino, but for every other hot and cold beverage. Although they are not thermal, you can microwave them and warm up your coffee if you missed the chance to drink it while still being hot. You can collect similar pieces from this manufacturer in different colors and styles. We use ours on daily bases and so far they showed themselves as a durable. They are dishwasher safe but I like to wash them manually because of their enamel finish. I am sure that everyone will enjoy these cups as much as my family does. 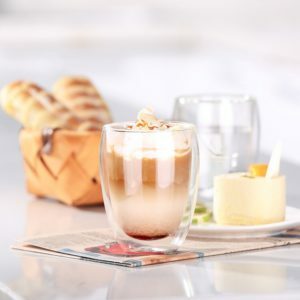 Ecooe 11.9oz Glass Cups for Latte, Cappuccino, Milk..
Another favorite in this list. These cups are so fancy that if there is any chance to eat meat from them I would use them for that too. These are transparent double wall insulated glass mugs with the capacity of 12 oz. The beverage looks like it is floating in these cups. They don’t have handles but they have a double wall and you won’t burn your fingers while drinking hot drinks from it. In this set, you get six borosilicate cups that are durable, easy to clean, pleasant to the eye and chic in their appearance. What else can you wish for? This set of cappuccino cups looked attractive to us because you get spoons made of thermal glass. Since all pieces of this set are made of glass and are transparent, they look clean and modern. In the set, you will get a four 6 ounce cups and four spoons. They are made of thermal glass and they have a double wall. You can hold cup directly with your hand, but there is also a handle that has a nice and wide space and even those with large hands can hold it easily. Made of lead-free borosilicate glass the greatest advantages are that they are light, you can microwave or cool them in the fridge and they are a dishwasher save. You can enjoy your coffee from these cups for a long time since they are top quality. And the last cups but equally fantastic as the previous ones. I must say that the appearance of these cups is more attractive than the appearance from some other cups in this list. 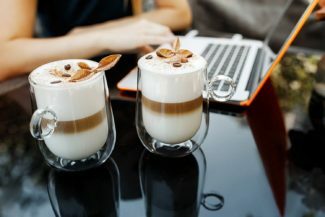 They are made of thermal double wall borosilicate glass and their capacity is 12 ounce, so they can be used for different beverages not just for cappuccino. The handle has the size and the shape of a ring so the holding is easy and practical. Since the cup is double walled, you won’t burn your fingers while holding it. And the most important, your drink will stay just the way you want it to be, cold or hot for a long time. Enjoy your coffee from these beauties. I know that this is the first item on my wish list. We tried really hard to find only the best for you. Some of this information is the result of a research but some of them are the result of a personal experience. We are sure you will find them useful next time you go for a cappuccino mug shopping. Previous story How Long Do Roasted Coffee Beans Last?